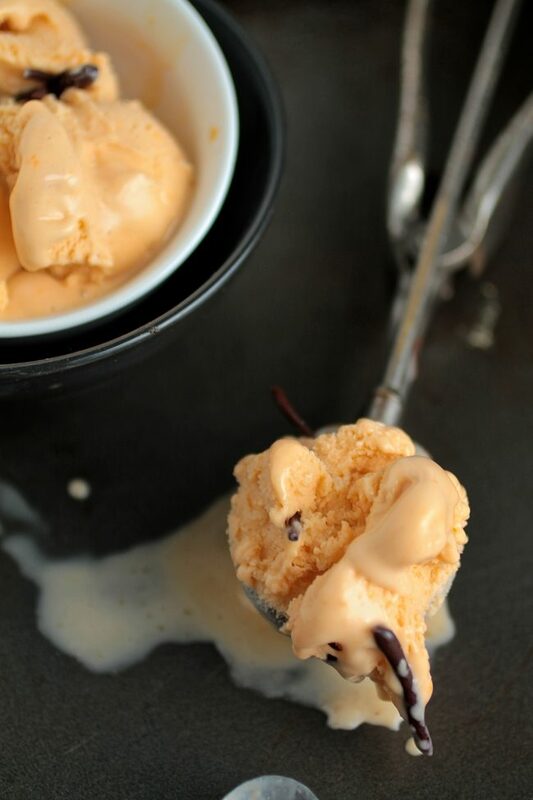 Homemade butterscotch ice cream is sweet and rich – the perfect twist for your regular homemade ice cream routine! I know, I know. I JUST posted a butterscotch recipe. But I decided to post another one because 1) It is delicious and 2) I had a giant bag of butterscotch chips that I needed to use up before we move in August (mission accomplished). By the way, you should probably prepare yourselves for a few weeks of recipes with seriously repetitive ingredients. I’m on a mission to use up all of our food before we head off to New York, which means I have to finally use up some stuff that’s been sitting in my pantry for God knows how long. Spoiler alert: I have a lot of chili powder, balsamic vinegar, and arborio rice (among other things). I promise not to use them all together. Unless I have a brainstorm and discover that those things together taste DELICIOUS. But probably not. Anyway. I honestly never thought of myself as a huge butterscotch fan until the last few weeks. I looked at this huge bag of it that I didn’t want to move with us to New York, and I was like, “okay, I guess I’ll put it in a cake or something.” And as you know, that was probably the best decision I’ve ever made. So THEN I was like, “Now I’ll put it in ice cream!!!! !” and that was the NEXT best decision I ever made. You see where I’m going with this? Me + Butterscotch = new BFFs. Also, I’ve decided that next week I will officially start packing. Not in a frantic “let’s-put-everything-in-boxes-TODAY” way. But in a calm, relaxed, “I-guess-I-can-pack-these-books-early” kind of way. Oh, hey, PS – I added a few nifty new blog features I want to tell you about! Remember how last week I told you I’d switched over to ZipList as a way to share all my recipes? Well, I’m happy to announce that I’ve also added links to the ZipList Recipe Box, Shopping List, and Meal Planner right on my main navigation bar (that big green one at the top of the page)! Just hover over “Recipe Box” on that menu and you’ll see additional options for “Shopping List” and “Meal Planner.” If you’re logged in, you can manage your box and meal planner right from Life As A Strawberry! How cool is that? Pretty cool, I think. Also, I’ve been thinking for awhile that I wanted to make it easier for you to Pin my photos on Pinterest. I pin all of my recipes once they’re posted, and MAN it gets annoying to have to GO to your bookmarks bar and THEN click your “pin it” bookmark and THEN try to remember which picture you liked and THEN you have to pick your board and UGH. Am I right? Us lazy people always need a more efficient (read: lazier) way to do things. So I added a mouseover Pinterest button feature to my site. Now, whenever you hover over a photograph, a little “Pin This” button pops up in the photo’s top right-hand corner. Just click that button to pin that image, select your board and BAM! You’re all done. It’s so easy! I can’t believe I’ve been living without this feature for a whole year. I’m already in love with it and I know that you will be, too. So Pin away! But back to this ice cream. If you know me well or have followed my blog from the get-go, you probably know that I am SUPER picky about my ice cream flavors. It’s pretty much the only area where I have zero desire to try new things or experiment with flavors. I like mint chocolate chip, chocolate, and vanilla with lots of chocolate sauce. In that order. And that is all. I’m serious. I accidentally bought cookie chunk ice cream or something a few weeks ago and it was the most depressing moment ever. So it was kind of a big deal that I not only CHOSE to MAKE an unusual ice cream flavor – but that I also ATE a ton of it after I made it. 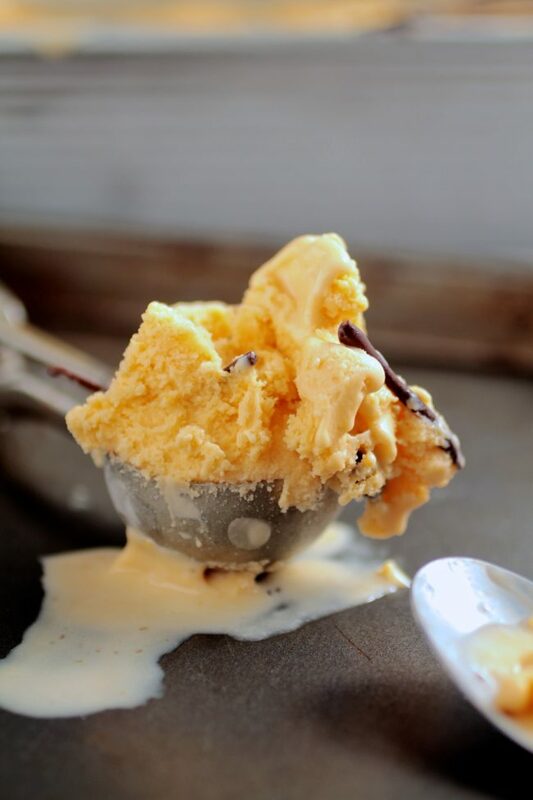 I think my new ice cream list is going to read: Mint chocolate chip, chocolate, THIS BUTTERSCOTCH ICE CREAM, vanilla with lots of chocolate sauce. NOT necessarily in that order. This is a breakthrough if there ever was one. In a large saucepan, heat half-and-half and 2 cups milk together over medium heat. In a separate bowl, whisk together egg yolks, sugar, and vanilla until the egg yolks have lightened. Set aside. 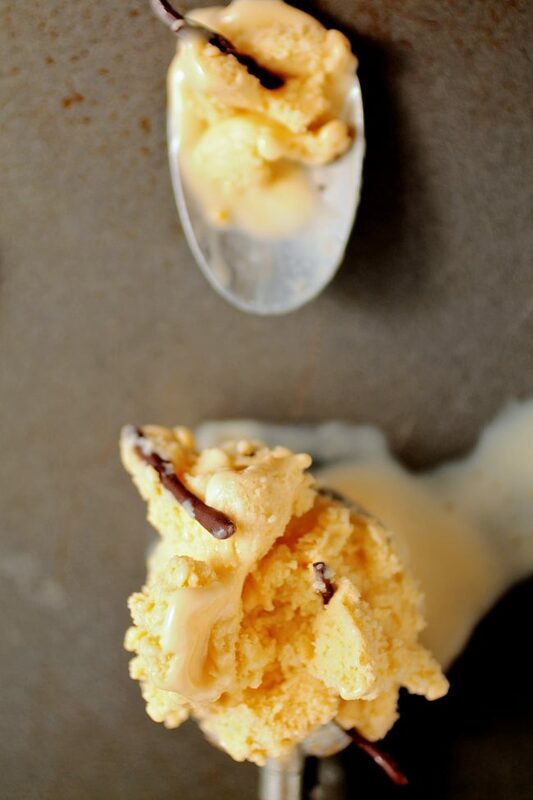 Melt together butterscotch chips and 2 Tablespoons of milk over a double broiler until butterscotch has melted. Whisk the melted butterscotch into the milk/half-and-half mixture a little at a time, until combined. Bring this mixture to a simmer. When butterscotch mixture has reached a simmer, temper it into the eggs by pouring a few tablespoons at a time into the egg yolks and whisking well between each addition. When you've added a little more than half of the hot liquid to the eggs, go ahead and add the remainder in all at once. This method of tempering will prevent the eggs from curdling while you cook your custard base. When you've whisked the eggs and butterscotch mixture together, return it to the saucepan over low heat. Stir occasionally while it thickens, about 5 minutes, and remove from heat when mixture is thick enough to coat the back of a wooden spoon. (See my Classic Chocolate Ice Cream post for more on this technique}. Remove the saucepan from the heat and let it cool for about 30 minutes. When mixture has cooled slightly, pour it into a large container, cover it, and pop it in the fridge for at least 4 hours (preferably 8 hours or overnight). When the mixture has chilled for at least four hours, pour it into an ice cream churner and churn according to manufacturer's instructions. It will be the consistency of frozen yogurt when it comes out of the ice cream maker - place it in a freezer-safe dish and cover it, then put it in the freezer to set (about 2 hours). 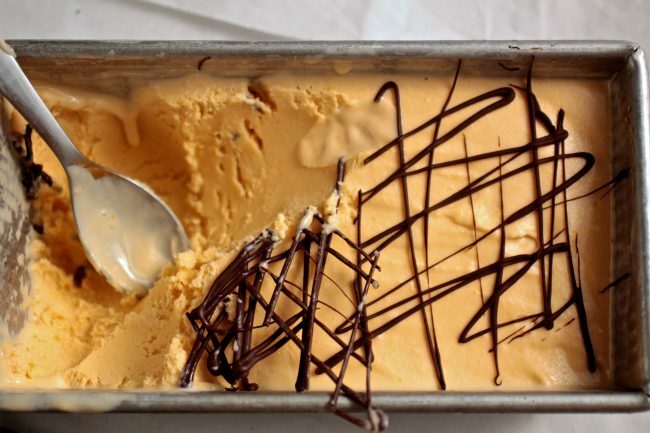 When you're ready to serve the ice cream, melt semi-sweet chocolate over a double boiler and drizzle it over the surface of the ice cream with a spoon to create artsy zig-zags. 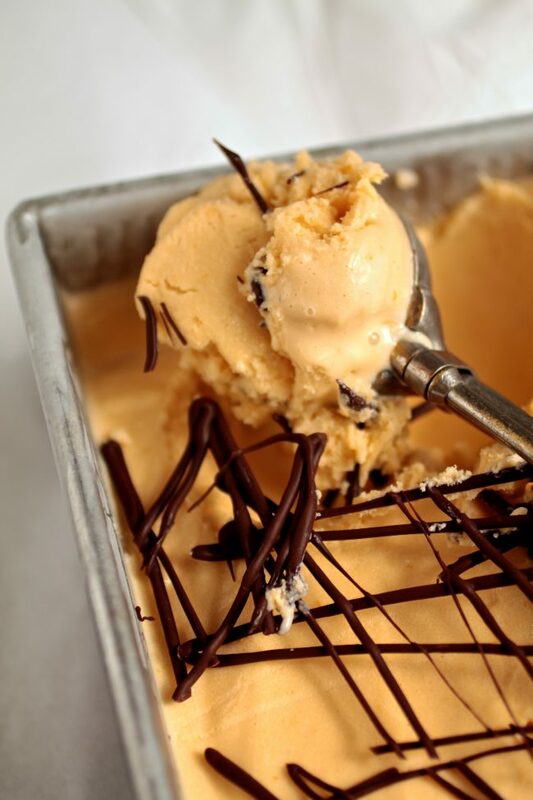 The chocolate lends a nice crunch and flavor to the ice cream - and it looks super pretty! How did you come up with 8 eggs for this recipe? 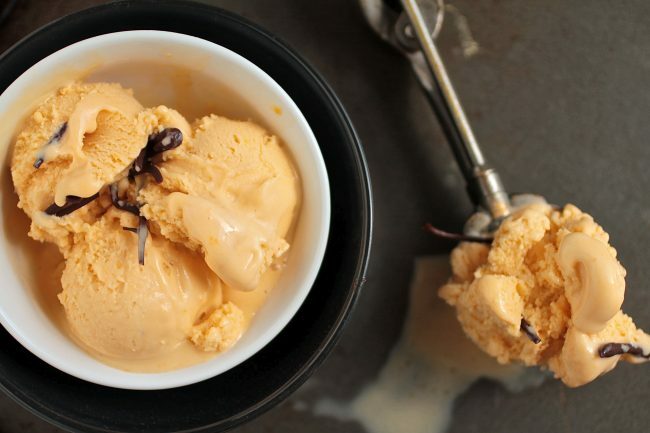 I never use more than 3 eggs in my ice cream recipes and they come out great. 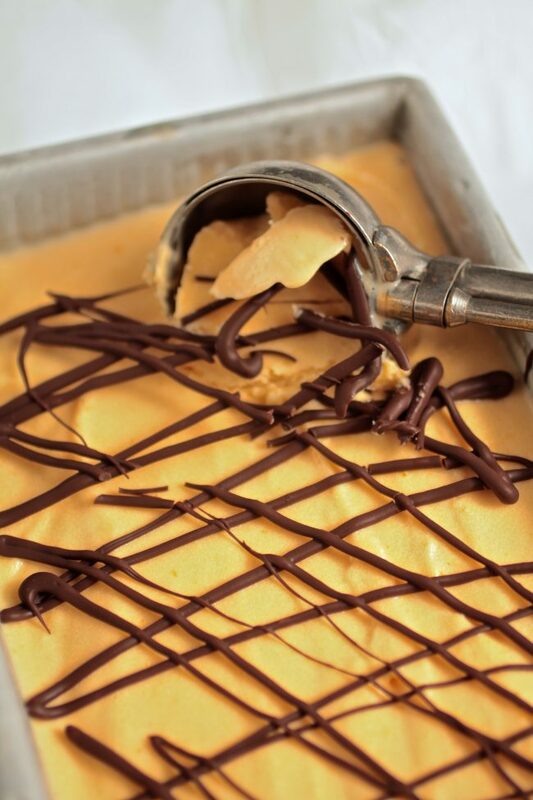 I love anything butterscotch and am looking forward to trying your recipe….but not with 8 eggs! Did you try the recipe with less eggs at any time? I based this recipe on my usual ice cream base with 8 egg yolks (not 8 full eggs!) 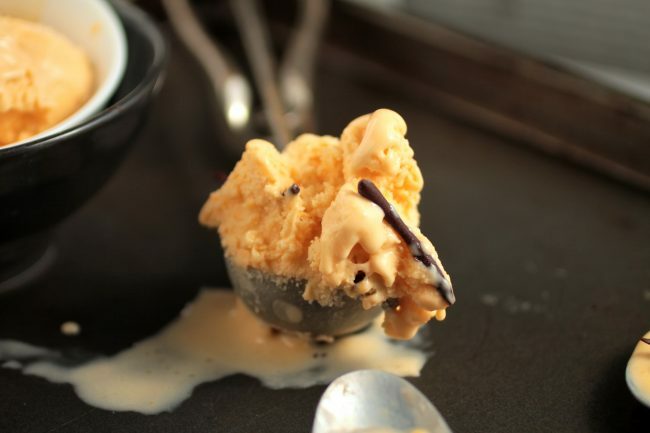 but you can certainly adapt the flavors to suit your own favorite ice cream base if you like!